Rhino poaching around the world is on the rise despite efforts to protect the animals, a report warns. The global surge in the illegal trade has been driven by demands from Asian medicinal markets, the study by conservationists concluded. It suggests that a decline in law enforcement is the main reason for the rise in poaching in Africa. 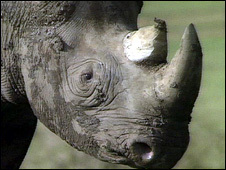 The report found that 95% of rhino poaching in Africa since 2006 had occurred in Zimbabwe and South Africa. The data was compiled by Traffic, the global wildlife trade monitoring network, and the International Union for Conservation of Nature (IUCN), with funding from WWF International. The findings have been submitted to the secretariat of the Convention on International Trade in Endangered Species of Wild Fauna and Flora (CITES), ahead of a key gathering in March. The authors added that poachers were now adopting much more sophisticated techniques such as veterinary drugs to kill their prey. "Concerted action at the highest level is needed to stop this global crisis of rampant rhino poaching," said Amanda Nickson, director of WWF International's species programme. "We call on the countries of concern to come... in March with specific actions they have undertaken to show their commitment to stopping this poaching and protecting rhinos in the wild." The report documented a "decline in law enforcement effectiveness and an increase in poaching intensity in Africa". 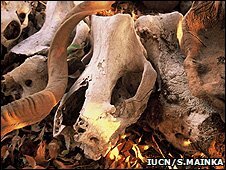 It said that the "most serious" situation was in Zimbabwe, where rhino numbers were "declining, and the conviction rate for rhino crimes is only 3%". Until recently, the nation's rhino population had enjoyed a recovery and had been stable for a number of years. But they also found that poaching and illegal trading in rhino horn were on the increase in South Africa, despite the introduction of a number of new anti-poaching measures. Between 2006 and 2009, the report listed 210 rhinos as being illegally killed in South Africa, with a further 235 being poached in Zimbabwe. "These two nations collectively form the epicentre of an unrelenting poaching crisis in southern Africa," stated Tom Milliken, a Traffic researcher. 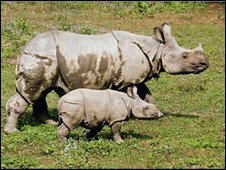 Traffic and IUCN added that Asian species, including Sumatran and Javan rhinos - found in Malaysia, Indonesia and Vietnam - were also a cause for concern. "Sumatran and Javan rhino range countries need to increase efforts to better assess the current status of many of their rhino populations," observed Dr Bibhab Kumar Talukdar, chairman of the IUCN Asian rhino specialist group. He called for enhanced protective measures, such as preventing the loss of rhino habitat and better "biological management", in order to ensure that the remaining rhinos had the best possible chance of survival in the future. However, the report concluded that some nations had taken considerable steps to improve protection measures. "Nepal, in particular, seems to have successfully addressed a serious poaching crisis," it observed. But it warned that the growing market for rhino horns in Asia, primarily for medicinal use, meant that all nations had improve their efforts to protect the threatened species. The IUCN Red List of Threatened Species places the African black rhino (Diceros bicornis) in the critically endangered category.